Is it starting to become clear that I’ve cheated and actually hosted my mini-Thanksgiving early this year? We were in Amsterdam this past weekend and Chris’ firm hosts a dinner for the US group on Thursday (oh and he has to work that day of course) so we figured better to celebrate early. More on Amsterdam later, but I’ll just say that I loved it and that you won’t be seeing Chris in any of our pictures because he is not only participating in Moe-vember but also has a cyst on his eye. Hot stuff. 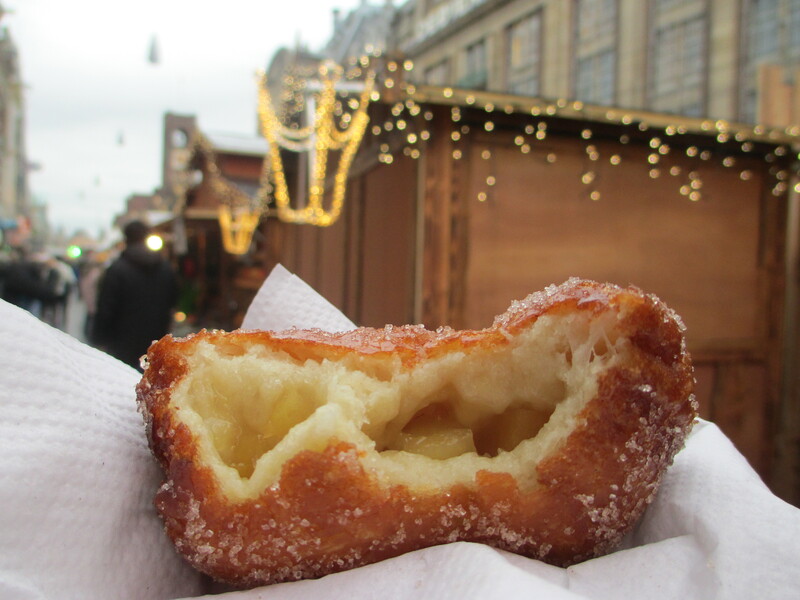 Instead, here is my appelbollen at the Christmas market. You’re welcome. Since it was just us and my two London-based sisters-in-law for “Thanksgiving,” I ordered a turkey breast from my butcher this year. After last year’s fiasco where the turkey was too big for my roasting pan and I had to cut off the legs, then the carving board was so big I had to wash it in the shower, I figured smaller was perhaps better. I waited until Saturday morning to pick up the turkey so that it didn’t take up precious fridge space. I sent Chris out for the turkey while I went to pilates and when I returned I was in for a bit of a surprise. 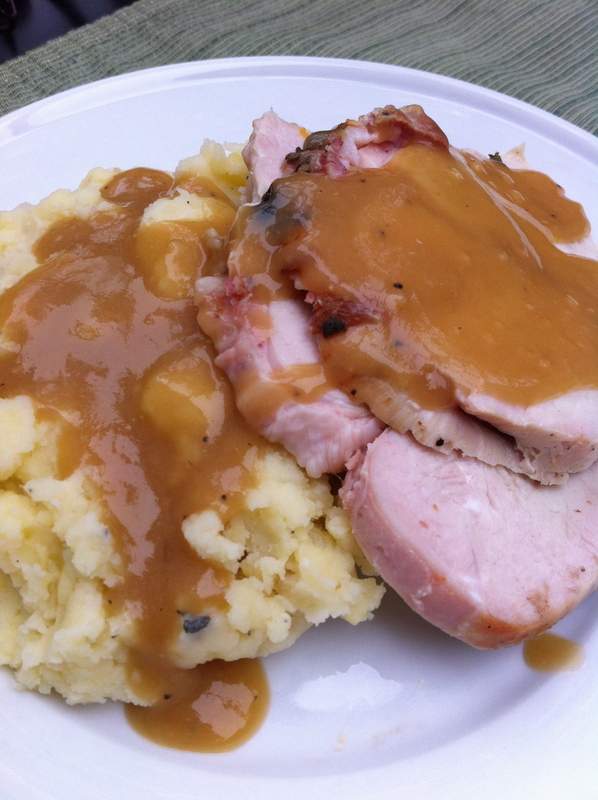 Apparently this turkey breast was from the world’s largest turkey – a solid meat baby. At least it was already wrapped and tied with twine. “Helpful,” you’re thinking. Yes and no. Under the tightly tied rope was a layer of very thick bacon. “What’s the problem?” you ask. “Bacon is obviously delicious.” But it was not fitting into my plan for gorgeous golden sage buttered crispy skin. Not willing to go to the effort of untying the breast, remove the bacon, and retwine, I went ahead and smeared my usual sage butter on top of the bacon for an extra indulgent bird. It was fine. Maybe better than fine. People talk all the time about their method for a moist turkey with crispy skin. Sometimes I change up the butter mixture, but method-wise, I cook the bird the same way every year. It never fails. I start the turkey in a very hot oven for about 45 minutes, then finish it low and slow and tent with foil if necessary so the skin doesn’t burn. As for the potatoes, once we went milk mashed, we’ve never gone back. 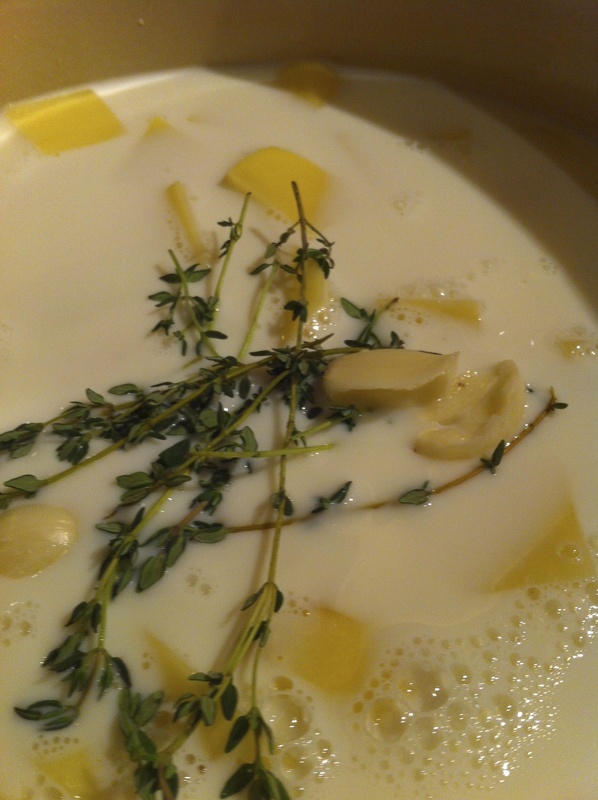 I got the idea of boiling the potatoes in milk from Tyler Florence about 4 Thanksgivings ago. I love that you then have super flavorful milk to add back to the potatoes for a creamy mash. 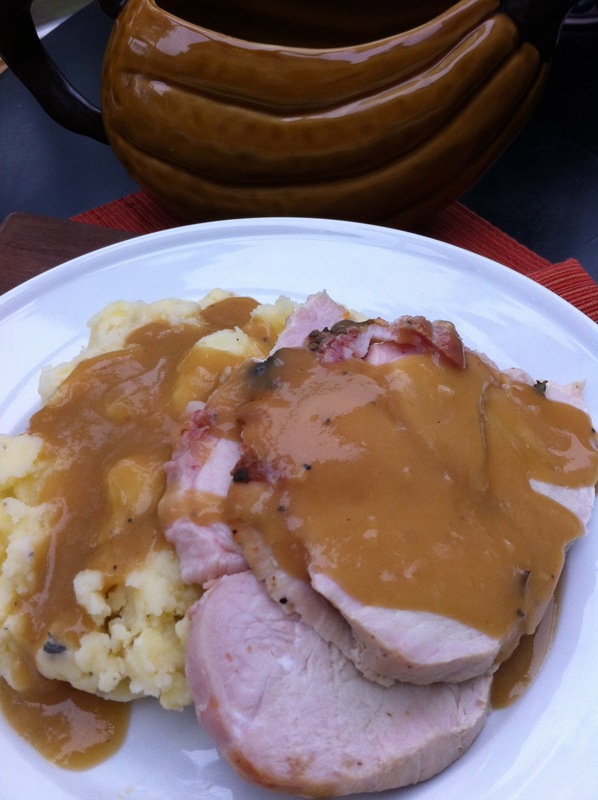 A great tip is to start your gravy before the turkey is out of the oven. I feel like I’m always scrambling at the last minute to make sure all the dishes are hot, the seasoning is spot on, everyone is seated, drinks are refilled, etc. So make a gravy base by melting butter in a small pot, then adding an equal amount of flour. Whisk in white wine (I like a rich Chardonnay with my turkey) and then chicken or turkey stock. Adding about 1/2 cup at a time will prevent clumping. Then when your turkey is out of the oven, just pour in the pan juices and you are ready to go! I’ve included my recipe for the whole turkey, but if you just do a breast like we did, follow the same instructions, just plan on a bit less cooking time. And obviously you won’t be able to place lemons and thyme in the cavity. Place the first four ingredients in the base of a roasting pan. Then pour about ½ cup of wine into the pan. Place turkey, breast-side up, on top of the onions. (Make sure to remove the neck and giblets!) 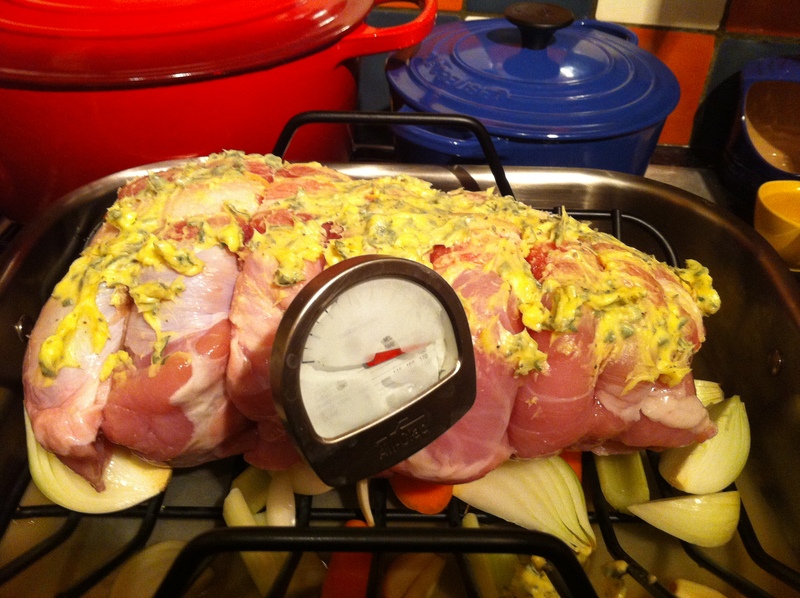 Place the lemon halves (once zested), thyme sprigs, and 2 onion wedges into the cavity of the turkey. Mix sage, butter, lemon zest, salt and pepper together. Loosen between the skin and the breast meat of the turkey. Rub the butter mixture onto the turkey under the skin and any extra onto the top of the skin. Bake turkey at 425 for 30 minutes, then pour about a cup of the chicken broth over the turkey, tent loosely with aluminum foil and bake for an additional 15-30 minutes. Once the turkey temp is 165˚F, remove the turkey, cover with foil and let rest until ready to serve, at least 30 minutes. 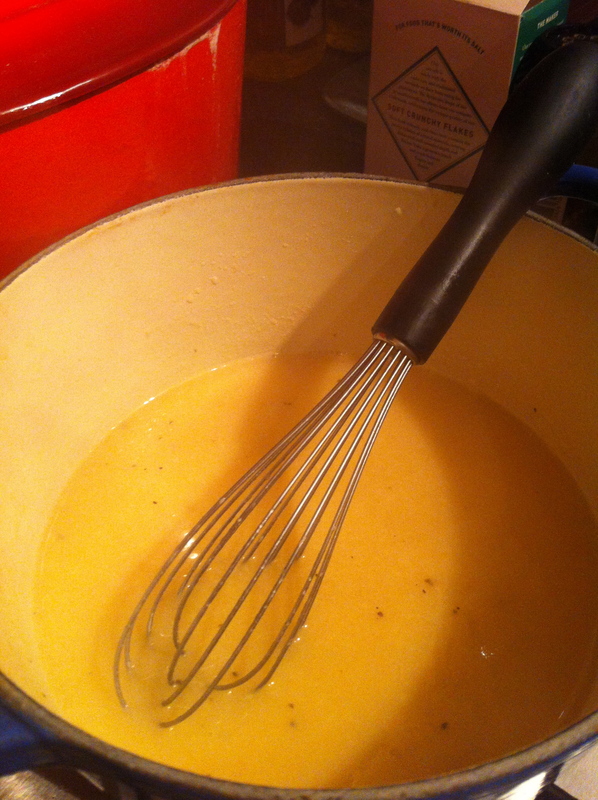 To make the gravy, while the turkey roasts, melt the remaining 3 tablespoons of butter in a saucepan over medium heat. Add flour and whisk for 2 minutes until the flour and butter have combined to a sandy-like consistency. Whisk in the remaining ½ cup of wine and stir until thick, about 2 minutes. Add ½ cup of chicken broth whisking until smooth, then add the remaining ½ cup of broth. Bring to a simmer, allow to thicken and then keep warm. Once the turkey is resting, pour the pan drippings into a gravy separator. Then pour the juices, minus the fat into the premade chicken broth mixture. Simmer for about 5-10 minutes until thick and smooth. Place potatoes in a large pot and cover with milk. Add the garlic and thyme and bring to a simmer. Continue to cook until the potatoes are soft enough to break apart with a fork with very little pressure, about 15-20 minutes. Drain but reserve the milk. Remove the thyme sprigs but leave the garlic with the potatoes. Add butter, salt and pepper, and about ½ cup of milk and begin to mash. Continue to add milk as you mash until you get your desired creaminess and consistency. Season to taste. *Save the remaining milk to add back to leftover potatoes.